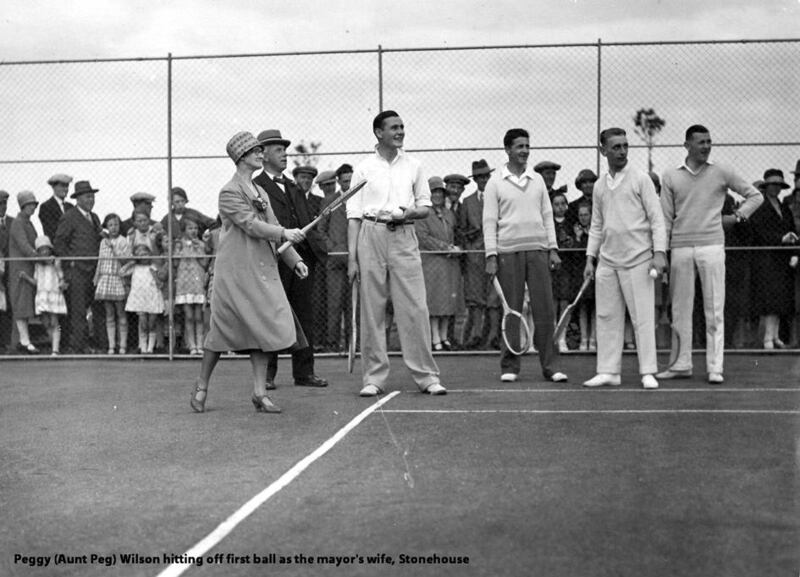 Stonehouse had a thriving tennis club, founded in the 1930’s, in Alexander Hamilton Memorial Public Park which opened on 30th May 1925. In 1942 cups were donated by local families: Gents Singles by D.M. Smith; Ladies Singles by Thos. Wilson; Boys Singles by Jas. J. Wilson; Girls Singles by John Summers; Mixed Doubles by John Miles. These were the incentives played for and won each year. The attached extract outlines the presentation of the cups in the 1942-1943 season when club president James McNiven introduced the proprietor of the Rex cinema Mr John Sheeran to say a few words prior to the cup presentations. Mr Sheeran paid tribute to the families and local businesses in the donation of the cups. he then introduced Mrs Daniel M smith to make the presentations. Stonehouse had its own local Wimbledon. The club flourished for a few years but gradually fell away and in 1961 and the tennis courts were deserted. In 1975, three former members decided to test opinion in the village on re-forming the club. Mrs. Aileen Simpson, Mrs. May Campbell and Mr. Jack Leggate arranged a meeting of interested parties on 8th May. A very heartening 59 enthusiasts attended. The five silver cups, property of the former club, were located and competition began again, with the addition of a Boys Juvenile Cup donated by Mrs.May Campbell and a Girls Juvenile Cup donated by Mrs. Aileen Simpson. The club resumed with 27 seniors, 30 juniors and 47 juveniles, a total of 104. The constitution, which had been devised in 1949, was hung in the club house at the tennis courts in the Public Park. The constitution was updated in 1978 and 1988. CONSTITUTION 1988. A committee was elected, including juniors and juveniles, giving many young people their first experience in decision making and planning. These skills were the basis for many future careers. As well as the regular tennis nights of Monday and Thursday and tournaments on a Saturday afternoon, the club was a social family for all it’s members. The committee organised regular discos and fund raising jumble sales in the Congregational Church hall. The club actively participated in annual gala days. To hold the club together over the winter months, regular events were arranged by the committee e.g. a bonfire night, a quiz night and of course the annual prize giving dance. Also badminton, which could be played indoors at the school, became the winter alternative. The club was so popular it had to start a waiting list for membership, as it only had the 3 outdoor courts in the public park and they were in poor condition. In 1977, Mr. Jack Leggate was made Honorary President as he was the first president of the newly re-formed club. The District Council supported the club by allowing the club 1 night per week free of charge for coaching purposes. The club had full use of the tennis pavilion where the council sold tickets for the tennis courts and pitch and put green. However, the state of the courts was always an on-going complaint as they were red ash which was not a good surface for the Scottish weather. Even if it was dry on a club night, often there could be no play as the courts were still waterlogged from previous days of rain. The Head of Leisure and Recreation for Hamilton District Council arranged to have the hard pan underneath the courts to be broken up and mixed with a new surface dressing, as well as having paving laid around the edges of the courts, to try to improve the condition. As the condition did not improve, the County suggested that the club try to raise some money or obtain sponsorship for any further improvements. Club fund raising just about covered overheads i.e. 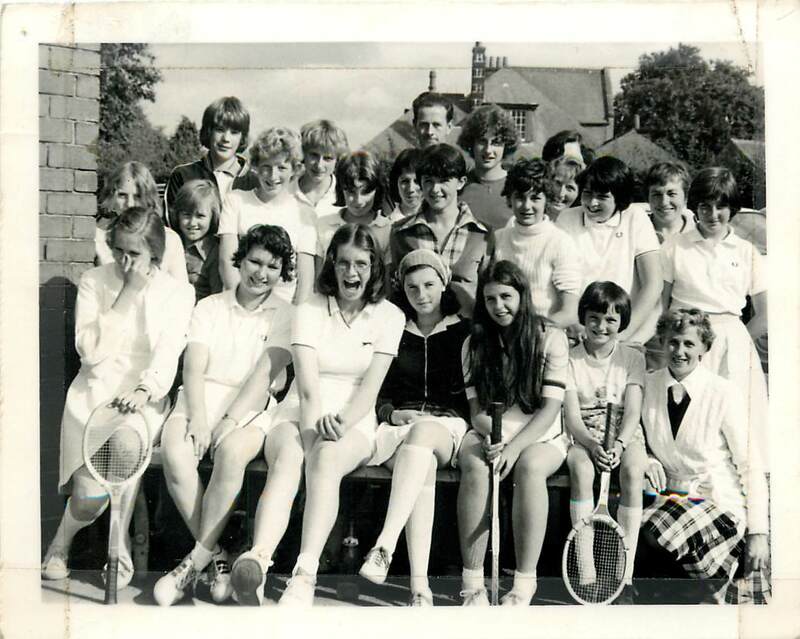 payment to council to use courts, donation to Congregational Church for use of hall, membership dues to West of Scotland Lawn Tennis Association, engraving of cups and purchase of trophies each year for prize giving, sending a few members on a coaching scheme to be able to bring on young players etc. A tennis club member, Mr. Ian Mooney, was elected to the Community Council to try to use this medium to push for a new pavilion and all weather courts. A report was submitted to the Council highlighting the poor facilities available in the village for all activities. Showers were provided in the small existing pavilion in 1981. Requests for later opening times during the summer months and for the back wall of the pavilion to be made smooth as a practice wall were refused by the council. When the Stonehouse Harriers, a thriving running club, needed changing facilities, this highlighted the poor provision in the tennis pavilion as it was too small to be shared. The council provided a portakabin beside the running track/ rugby field next to the tennis courts. Drainage was always a problem with the red ash courts. The best players now attended Hamilton Tennis Club, which had better facilities. Despite the committee’s efforts to keep young members occupied when there were too many for the courts or the courts were unplayable, unfortunately the club started to fall away again. A petition was raised “The possibility of Stonehouse Tennis Club losing members and becoming extinct will soon be reality due to the inferior condition of the public courts. We the undersigned feel it is the duty of the District Council to prevent this and urge them to take immediate action”. In 1989, new courts were provided at a cost of £45,000, but this led to a lost season as they were supposed to be completed for the start of the season and were not opened until the end of August. Non-completion meant no practice and a slip in standards. The new courts were laid marked for tennis and 5-a-side football. This led to the tensioners on the playing surfaces being damaged while football was in progress. The TECHNOTILE surface was a disappointment. So despite the new all- weather courts, the club was in trouble. Loss of income due to subscriptions being down and less membership to support fund raising led to difficulty in covering essential expenses. Another problem for the club was vandalism of the courts and local youths using the park at night for drinking alcohol. The local police did not patrol the park or curtail this despite saying they would monitor the situation. (Hearsay was that the police did not want to move the youths on because if they were in the park they knew where they were and were contained which was preferable to youths roaming the streets of the village) Club members did not feel safe. The momentum and enthusiasm of the original reincarnation of the 70’s and 80’s was lost. Sadly it’s best years had been in the “bad old days” of bad bounces, filthy socks, six inch deep puddles, loose lines to trip over, nails to stand on and grit in the washing machine. A crisis meeting called on 2nd May 1997 was so poorly attended that it was followed by a committee meeting of 5 members on 1st June to officially close the tennis club. In February 2009 a discussion took place among former members on what should become of the assets of the former club. As more than 10 years had passed since the club was disbanded, and there was no longer any tennis facility in the village of Stonehouse, the monies should be distributed as per the constitution “Failure of the Club”. Money was gifted to local groups as follows: Stonehouse Heritage Group £100; Stonehouse Christmas Festival £100; Stonehouse Gala Committee £100; T.A.B.S. Drama Group £100; Family Support Group £100; Stonehouse Better World £100; Scout and Guide Hall £100; Boys Brigade £50; Girls Brigade £50. Trophies were returned to the donating family where possible with the remaining trophies being held by Stonehouse Heritage Group. The cups which had been valued in 1992 by auctioneers L S Smellie & sons Ltd were valued at £1,120.00. This history is written in July 2013 when Andy Murray has just won Wimbledon. Sport Scotland are going to provide funding to encourage and regenerate clubs to bring on more youngsters in tennis. Sadly this is all too late for Stonehouse Tennis Club. The families of the 3 members of the first club who started up the club again in 1975, can be very proud of this achievement in providing an extended family for a lucky generation. For those interested in the past club champions, cups and cup winners the following links provide a list of cup winners and show a picture of the cups.